EUTRO-CLEAR SB is a proprietary blend of standardized organic, naturally occurring endosporic microorganisms. 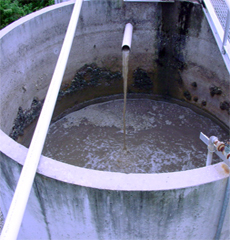 EUTRO-CLEAR SB Wastewater Treatment contains microbial species that have an affinity for biodegrading industrial wastewater, containing high levels of VOC's with extremely high BOD's, specifically difficult substances such as phenols, phosphorous, chlorinated hydrocarbons and proteinaceous compounds, at accelerated rates. It provides rapid hydrolyzation of fats, oils and greases to fatty acids which is followed by biological absorption and digestion, that prevents and even eliminates grease deposits and odors. You will also see a drastic reduction in BOD and COD levels when used as directed. BOD is reduced. Those facilities that wish to recycle their bio-solids for commercial fertilizer use will benefit greatly from Eco-Impact SB . Regular use of the Eco-Impact SB - Wastewater Treatment results in a cleaner end product. Regular use of the EUTRO-CLEAR SB for - Microbial Wastewater Treatment in the aerobic and anaerobic digesters will result in a cleaner end product by eliminating fats and hazardous organic compounds from the bio-solid component. This product combination is excellent for the remediation of cesspits, lagoons and bio-hazardous waste dumps. It can be pumped down "deep wells" for the remediation of surplus stage 2-wastewater disposal. EUTRO-CLEAR SB for Wastewater Treatment contains the standardized CFU count of 5 billion per gram that can be used to inoculate the media of biodegrading systems, resulting in improved and accelerated digestion of organic solids and VOC's. Mix 1 or 2 lbs of product in 5 gallons of unchlorinated water. Let mixture stand for approx. 2 to 6 hours, stirring occasionally. Pour the mixture into the system. For an average size restaurant use 5 gallons ( 1 to 2 lbs of dry product) of BOD-Clear SB GT per month, dispensed as multiple doses. For best results, pump trap before beginning treatment and shock trap with 5 gallons. Due to inherent variances of the effluent within each wastewater treatment facility we prefer to prescribe products, rates and methodology and recommend process engineering on an individual basis. Daily applications guidelines are based on daily flow in the first stage for the reduction of BOD Levels and ammonia levels. Use higher dose when starting BOD levels are greater than 400, retention time is less that 48 hours or when systems water temperatures are below 55 degrees or above 120 degrees F.
When implementing this bio-augmentation program, it is essential to provide the microbial systems with as much retention time as possible, in addition adequate dissolved oxygen levels (1.5 ppm or greater) will expedite their establishment and increase product efficiency. When applying product to system, divide dosage rate equally between the equalization tank and the aeration tank. Limit the use of bleaches, sanitizers, and other chemicals. Dispense product at times least likely to be followed by the above. Regular use of BOD-Clear will significantly reduce the need for grease trap pumping, but will not eliminate it. Double recommended dosage if water temperature is 68°F (20°C) or less.